When the world’s deadliest, stealthiest, and most infamous assassins need a place to educate their children, an institution that respects and upholds their values, they turn to the prestigious School of Five Weapons. 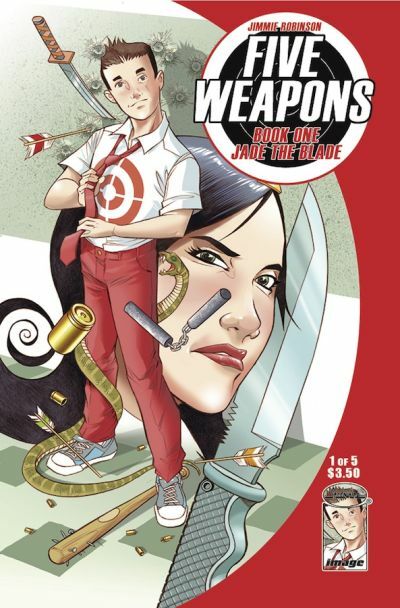 At the setting of the new Image Comics/Shadowline mini-series by Jimmie Robinson (BOMB QUEEN), FIVE WEAPONS, students train in the martial arts, pledging their loyalty to one “club”: Knives, Staves, Archery, Exotics, and Guns. The School of Five Weapons is turned upside down when a new student arrives, one carrying a name that all the students and teachers know: Shainline. The clubs vie for Tyler’s loyalty, but it becomes apparent very quickly that this kid isn’t someone who is easy to pin down. Tyler has just the edge he needs to succeed at Five Weapons - a razor-sharp mind! Robinson writes and draws FIVE WEAPONS, and his clean, lively art is colored by Paul Little. The mini-series has the same mischievous tone as Robinson’s series BOMB QUEEN but was created for a wider audience, as the “T” (teen) rating indicates. Comic Book Resources featured a four-page preview of the first issue of the series. The showdowns are epic, the secrets are dark, and FIVE WEAPONS is insanely fun. The first, 32-page issue can be pre-ordered from the December issue of Previews and will be in stores on February 27.